Showing 183 of 330 Gainsight ratings and reviews. Review: "Gainsight helps us know when our customers need help before our customers know they need help"
Customer health score, which basically models how well your customers understand, and drive value, from your product. CTAs, which you can trigger to your CS team in order to help them proactively reach out. MDA, which flattens your objects across Salesforce, Marketo, Mixpanel....etc and let's you create rules (or flows) to trigger different events and field updates. The user interface needs some work, for example, when you're creating a rule, sometimes you hit "next", but sometimes you have to click on the next number in order to progress. It's a bit wonky. Maybe create out of the box reports that can help admins show the value of GS with the exec team. Review: "Gainsight made our lives easier and happier"
Gainsight makes reporting from various data sources very easy and intuitive. It is easy to generate reports on-the-fly and add visualization before publishing to a Dashboard. It is also easy to re-arrange data to make it faster to create reports or generate contact lists to use for outreaches. The Rules Engine is a powerful tool for generating Calls to Action as well as being able to update fields on account records. The Program function in Journey Orchestrator allows us to send a variety of email communications especially with multiple message variants and if we need to send follow-up emails automatically or create a Call to Action for the CSM. The shareable functions of Gainsight - Share 360, Success Plans - are really great features for being able to provide additional value to customers and provide them insights into their account and usage. Timeline is so much more robust than creating activities or tasks just within CRM. Timeline provides a way to track meetings and other events, add multiple participants, and even create follow-up tasks (CTAs). The Support from Gainsight as well as the Community has been very important to helping us get the result we want quickly. It would be helpful to have more integration with email and calendar applications so that email could be sent from within Gainsight from any email within Email Assist (CTAs), or CSM calendars could sync to the Timeline function on the C360 view. Reporting is a great feature but it could be more aligned with how we can build datasets within Rules Engine or Program queries (bionic), allowing us to combine data from different sources without having to create a new data table to query. Folders, folders, folders - we build a lot of email templates, outreaches, and rules, and there is currently no way to organize these so it just becomes a giant list that has be queried to find the one item you want to work with. 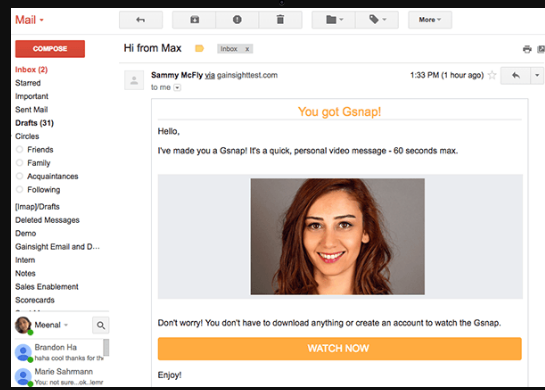 User Review: "The powerful tool that is Gainsight"
Mass email automation. We have been able to better scale our business , while still engaging with customers, through the use of Gainsight. Process automation. I have been able to stay on top of our data and and efficiency goals via the use of Gainsight. We have also been able to add and improve some of our offerings via the capabilities of Gainsight. Documentation. They have improved in the volume of documentation recently, but the search-ability and usability is still lacking. I know the features are there, but it is sometimes difficult to understand how to use them. Product Usability. Again, like documentation, the product is immense. I just wish it was more naturally intuitive. I like to compare software to the Apple platform. They are the pinnacle of user-friendly. I think Gainsight could learn a lot about the simple, yet powerful, framework of software like Apple's. 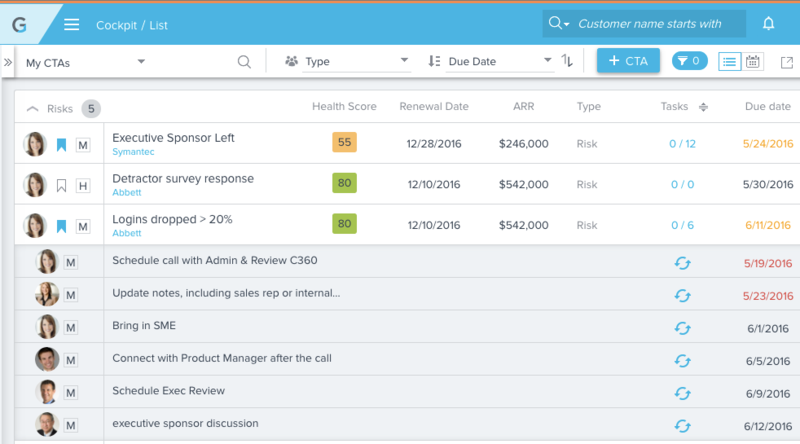 Review: "Keep your fingers on the pulse of your customers with Gainsight"
Gainsight provides a large team with a consistent playbook of tasks that result in a consistent operationalized customer experience. IF an organization is seeking the same high quality experience for customers from Toronto to Tempe they will appreciate the calls to action that present tasks for their team members and the dashboards that allow the team management to have insight into the programs success. Along with a phenomenal product, the Gainsight team members are great business partners for success. From the regular meetings to share best practices to the partnering to integrate their solution with others, they are great business partners. Gainsight delivers on its product road map. If you have an opportunity, watch a Karl Rumelhart product road map presentation to see the direction of Customer Success! I'd recommend new Gainsight users keep initial configurations simple to allow focus and faster ROI. Many users, my own instance included can grow quickly to try to accomplish too much. Controlled quality growth, and product configuration scope, would be a good mantra to keep in mind. User Review: "One of Gainsight's biggest fans!" The genius behind Gainsight is the rules engine. We pump in the usage data, along with customer information and create "if this then that" rules. The rules are very powerful and I've yet to run into something that was not possible. Gainsight offers a lot of flexibility in the creation of manual CTAs, and this allows us to use to track risk and service disruptions. Gainsight is a powerful platform that integrates well with other tools we use or plan to use. 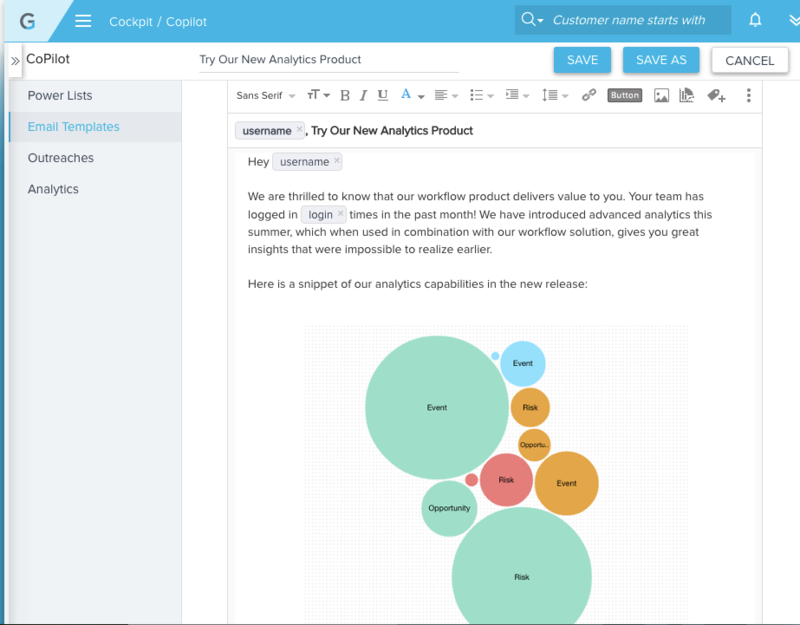 Gainsight is not an analytics tool, but it could be. Typically, I download reports and manipulate it myself. I also wish non-admins had the power to create their own reports. User Review: "Gainsight: I dig it!" 360 takes too long to load. Journey Orchestra has to be cloned and can't be edited once created. would be easier to be able to make edits in existing programs. would like to add a new Customer Status in addition to active, inactive, churn. Review: "Gainsight saves the Customer Success puzzle"
Roll up reports across the entire organization to glean insights that can be sent to other departments. 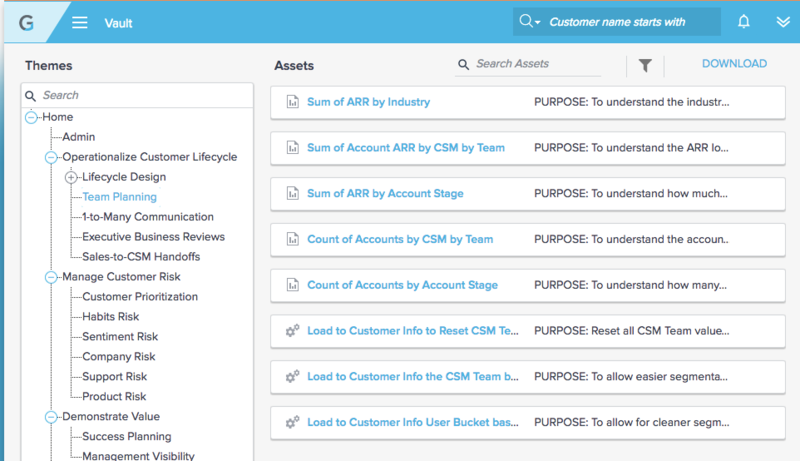 Track and triage big moments in a customer lifecycle. Create tasks for Success Managers to mitigate a customer heading down the path of churn. The Reporting module is only intuitive if you have extensive training on it, not even for someone who works in the SaaS space or is a heavy user. Creating manual tasks within CTAs can be very time consuming. It is best if everything rolls of a Playbook. The email notifications come in - at best - a daily digest. User Review: "Gain productivity with Gainsight!" Gainsight: "Great tool for Customer Success Management - fun to use and administrate"
User Review: "Gaining Momentum with Gainsight!" Prepares me from an executive perspective when I am about to enter into a client meeting and I can pull up the history on my mobile app. Everything including history is at my fingertips. Dashboards that allow me to see what is going on in my portfolio and allows me to be proactive and get out of the rat race. Share information internally and externally to hold everyone accountable and maintain transparency. Success plans can be more pleasing to the eyes and user intuitive. Email automation - however we are receiving this in the next month and am excited to leverage it with timelines! Being able to enter CSM assessment from the timeline and show real time in the scorecard. I believe it is coming soon! Gainsight Review: "Become more proactive with your Customer Success Teams"
Enables proactive outreach and responses to positive or negative trends in usage, support or financial data. Review: "Gainsight the tool the creates and help build cross-funtional Customer Success." Derived a customer health score. Helps give visibility into every account in one place. Pushes Proactive Calls to actions to the appropriate people to act one. Pushes tech touch automation based on triggered events for the "long tail" customer segment. The rule writing is not super intuitive. Would be nice to have it more of a click build that did not require so much technological administration of the tool. Pulling in the basic customer data, and deriving a basic heath score should be more out of the box and simple to do so that customers can get value quicker without having to get services involved. Gainsight Review: "New user and happily getting acquainted with the system and its value"
Review: "Gainsight Takes the Guessing out of Customer Success"
Timeline - Finally one place to capture notes pertaining to an account/customer. Review: "(Almost) One Year as the Gainsight Administrator"
Customization of tools. It's an extremely powerful tool to implement your client success operations strategy and increase retention. Client support is very fast to respond to inquires. The Gainsight Vault and Community are both instrumental in learning the platform and enhancing your strategy. Gainsight has a very steep learning curve. The unique terminology of Gainsight can be a bit opaque as to what a particular piece of data represents. 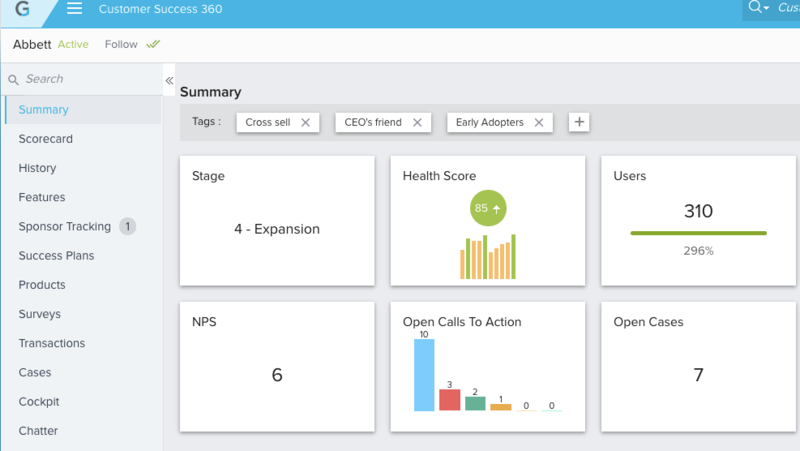 User Review: "My insights start with Gainsight"
Creates and manages CTAs for all your CSMs to plan their day/execute on your customer success engagement strategy. Provides you with usage/engagement reporting on all of your customers. Establishing segments within your customer base. Review: "Looking to increase your performance and customer relationships? Gainsight is for you!" 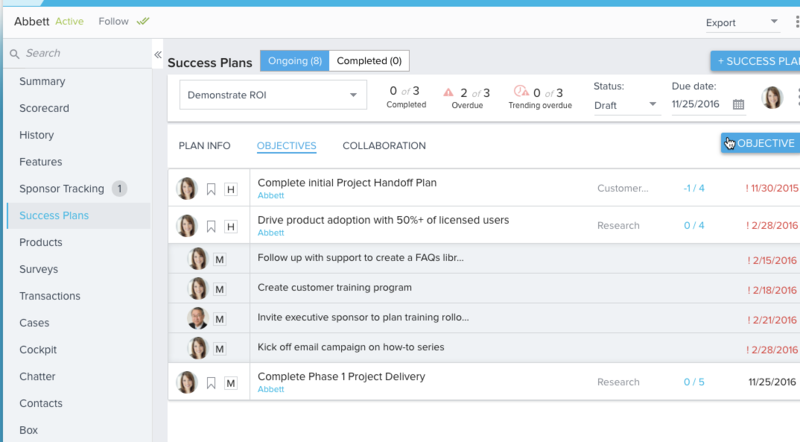 The ability to build specific dashboards for internal customers in the organizations. Customer 360 is a great tool to provide a view about how a customer is doing within our company. 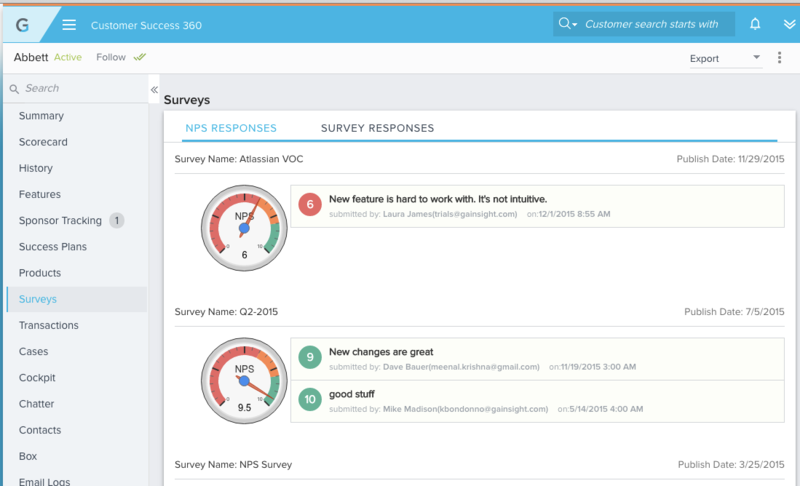 The NPS Survey is a great tool for any company that uses Gainsight. The differences between MDA Objects and Data Spaces, these are not allowed to be interconnected, this should be possible. Being able to create joined reports between objects in the report builder would be a great addition. Provide more flexibility at the moment of creating reports from objects related to the NPS Survey, sometimes is hard. Review: "Gainsight is a solid tool for everything customer success and beyond!" Communication: Gainsight makes it really easy to track emails sent through the system in one place. Process: We can hold our people accountable with CTAs. Survey/NPS: Gainsight makes it really easy to create/track surveys. We never really surveyed our clients like this and it's nice how it is tied to each account. Health Score Cards: We're able to set up parameters on what is a "healthy" client, which is very helpful. Journey Orchestrator: The UI for creating emails is painful and very outdated. Gainsight Review: "Go with the obvious market leader in customer success"
More and more prescriptive. They've invested a metric ton in a body of content that you can leverage inside your business to evangelize customer success as a stand-alone domain. Forgiving services model. While structured around an SOW, they're flexible and focused on success. Community. It's rare to see a company their size spend so much time on events, but it's a rewarding investment on their part and your part - you do meet and learn from the people who are good at this, and they do a great job facilitating. Prescriptive business applications ecosystem. A point of view here, and content around that, would be a huge win. Prescriptive career tracks. Given customer success is a new domain, a lot of the first generation came out of customer service. The new generation is coming from other places, and forging that ground is hard solo. Review: "Gainsight - Consolidated Customer Insights"
Gainsight does an excellent job of listening to product feedback given through their Community, implementing those changes when they determine they are a need for many customers, and then informing users that the changes have been implemented. Gainsight is an excellent tool for automating lifecycle communications with customers while still maintaining a personalized touch, thereby allowing us to scale our operations. 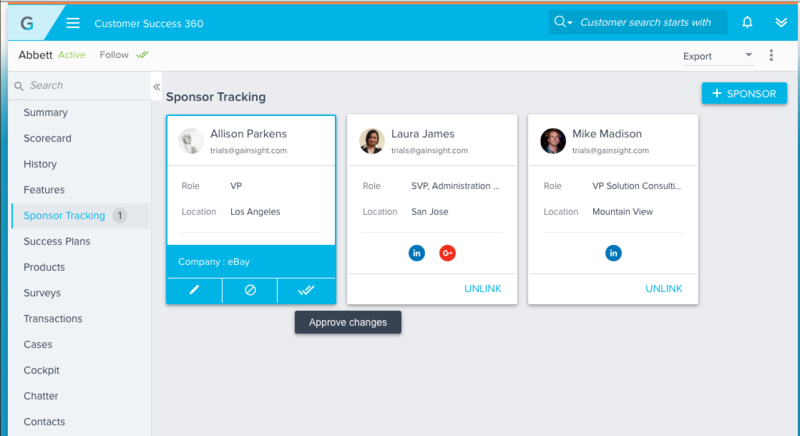 Gainsight has a good lineup of integration options to allow us to bring all of our customer data into one place to have a unified customer record. Gainsight could do a better job of allowing for one-off exceptions. It does a great job of helping to address the needs of the majority of our customers, but when one customer's needs create a special use case, it is rather difficult to make adjustments for that one customer. Editing programs created through the Journey Orchestrator is very difficult. Sometimes we need to make a small change to the criteria of a program after we have already started running it, but we can't do this without ending the program, cloning it, and starting an entirely new program. User Review: "Gainsight: the best in class!" Gainsight Review: "Great tool for account managers and client success managers"
Visual -- at a glance you can get a complete snapshot of the account: their usage, activity, and how likely they are to churn. This provides opportunities for proactive outreach. CTAs -- a very well designed system that allows you to create CTAs around renewal dates, data usage, survey responses, and prospect outreach. Automation -- Gainsight allows you to send out automated emails based on a client's usage. It allows you to customize several different features and review before sending, which is helpful for AMs when managing a large book of business. No ability to filter CTAs by type. Parameters for setting up automated emails can be restrictive at times. Review: "Gainsight is a thought leader and has the best software in the customer success space!" Review: "Optimize your CS business with Gainsight"
Gainsight says they enable business transformation through their passionate community, proven expertise, and cutting edge technology. In addition to the largest customer success community, the vendor says they also have a diverse, 333+ customer base spanning across Fortune 1000 companies such as HP, Cisco and Adobe and growth businesses like Box and Shopify. Via their community and customers, Gainsight says they have developed deep expertise around customer success best practices which are embedded into the product. Additionally, the vendor says 50% of their company headcount is dedicated to R&D, and that their platform can serve business needs across various customer segments. The vendor’s value proposition is that their product innovations are consistently first to market and built to scale from day one. Gainsight says their customers see an average of 4% higher retention and 20% faster growth than their peers.